Jane Flanagan, DEADWEIGHT, Rachel Anastasia, coldrooms, m.fay, sew nancy, Florence, Tracey, Sweet Harvest Moon, Julia: Thank you for the comments. I'm glad you enjoyed! Camille: That's so cute! English is my main language, and I still had a lot of misunderstood lyrics. I didn't know what "hobnail boots" were until I came across them in a Beatles song! michelle: Thank you! I really like my little sequined clutch. Anonymous: The counting is very, very quiet! You can only hear it on headphones. George Martin was the Beatles' producer, a very talented man! Ringo, have a banana! : My parents didn't listen to the Beatles, so when I discovered them, it was really almost life-altering. Is that exaggeration? Probably not! hila: Glad you like it. I struggle to find things that I think are truly, truly original in this funny little world and I think these zines are so unique and incredible. I really admire LJ & Liz for just doing it. Apricots+Silk: Oh yes, enjoy these years! So important. Copper&Whim: So sweet of you to say, thank you. So beautiful. 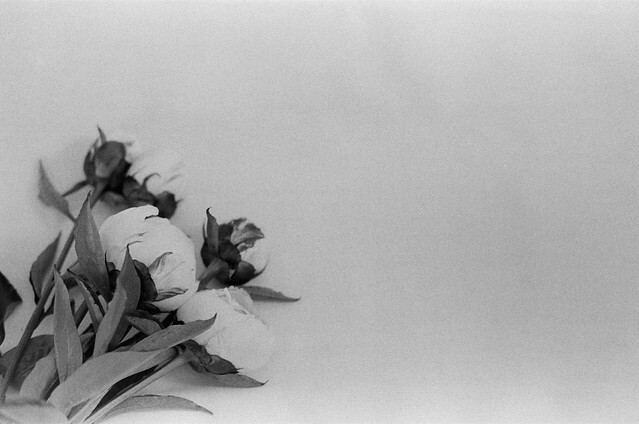 I love Neopan! Actually, I love these so much! I really like them just the way they are. So pretty and totally unexpected. Wow. 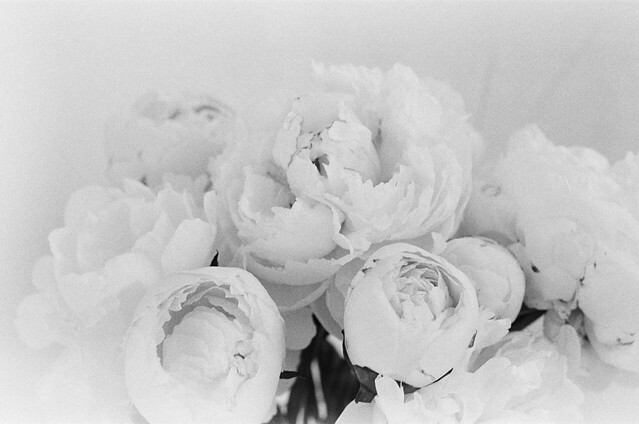 Peonies are my favorite flower and so luxurious. These photos are so beautiful. They would make the most romantic invitations. 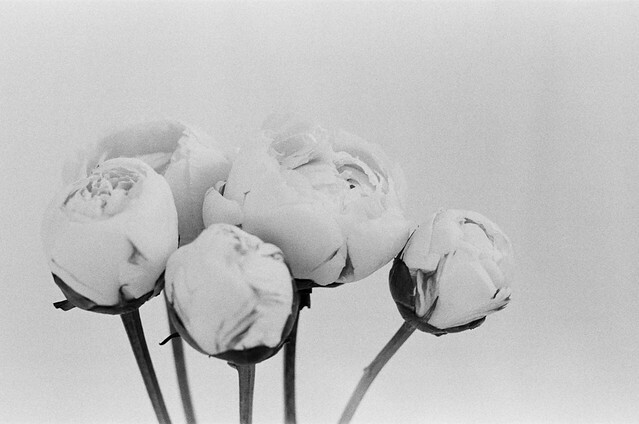 I have a Fuji Neopan picture of some flowers from Coriander Girl, neopan does wonderful things for flowers. Wow! These turned out amazing for being an accident! So lovely. these are lovely in black and white. peonies are my favorite. gosh, these are gorgeous images! So dreamy and simple gorgeous. A happy accident indeed! peonies are my absolute favourite flowers! these are gorgeous. insane. Well, it still looks beautiful and they would make a nice wedding invitation. Happy New Year! 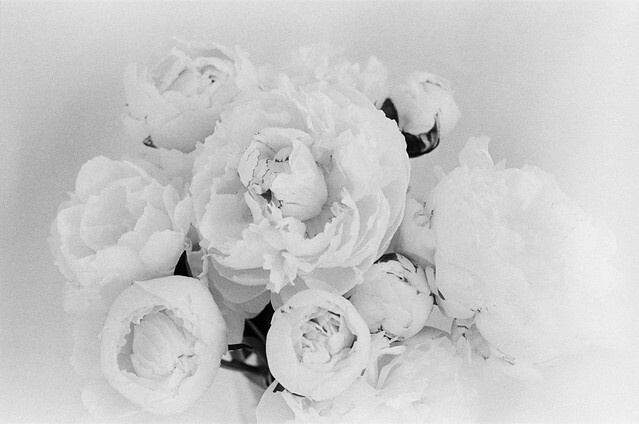 love these photos, peonies are always so beautiful! Looks like ghost peonies are the best kind! Happy new year! 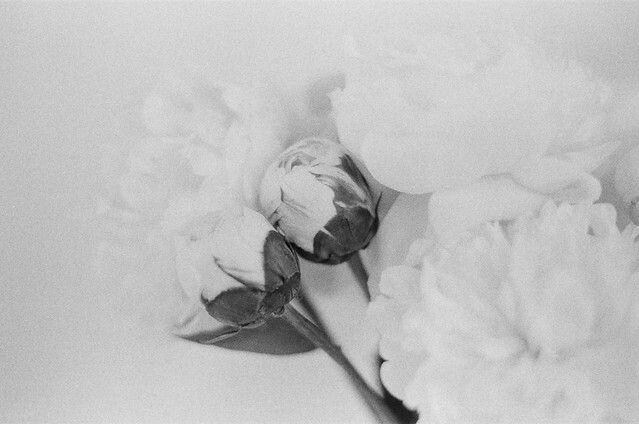 I love peonies, but I never thought to photograph them in black and white. What a perfect accident. These pictures are stunning. beautiful, like something out of an old book you'd be lucky to find. happy new year! these are beautiful anabela! what a lovely surprise this must have been! the photos are beautiful, anabela! This makes me want to go buy fresh flowers! I think I have just found my new favourite flower. Peonies are my FAVORITE FLOWERS. One of my favorite things is in the spring when you start to see them everywhere- so pretty. Those are so beautiful... Any chance of prints? wow... these are stunning. an lapse in memory produced such beautiful images. they remind me of little cracked egg shells.... so fragile. love them... thanks for sharing! a most beautiful mistake! love love love these. gah. speechless. 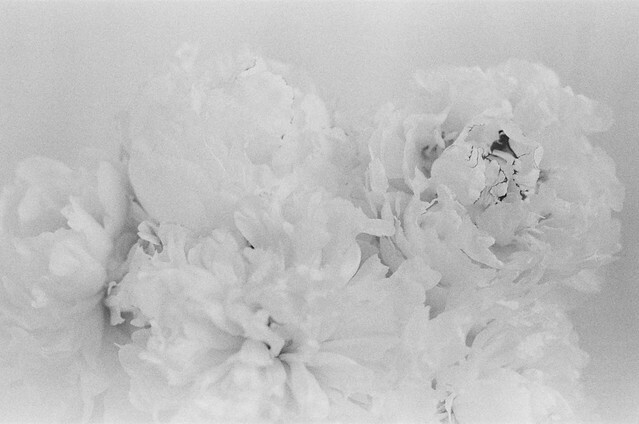 peonies all the time, always, of course. what a nice surprise though, that film. this is a very, very beautiful accident. I'm so glad you took these shots in black and white! The 5th and 6th photos are gorgeous. 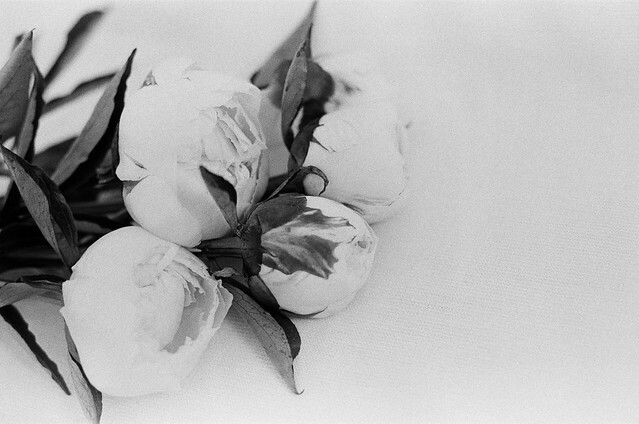 I'm a Tri-X and Tmax girl, but this post has inspired me to try Neopan. I always forget which film is in my cameras, too. I love all the photos.. I am glad to know.